Maria Pasqua Zampini first appears in the Painesville, Ohio, area in 1934. 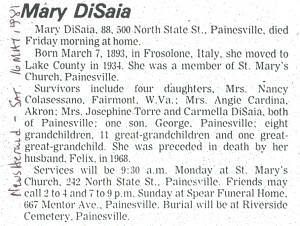 In America, Maria Pasqua Zampini was known by her married name, Mary DiSaia. Maria Pasqua Zampini, daughter of Giuseppantonio Zampini and Angelantonia Notte, was born on March 7, 1893, at Frosolone, Italy. She married Felicantonio DiSaia, son of Egidio DiSaia and Annunziata Maselli. Maria died on May 15, 1981, at her home 500 North State Street, Painesville, Lake County, Ohio, at age 88. Her body was interred at Riverside Cemetery at Painesville, Lake County, Ohio. Maria Pasqua Zampini immigrated to the United States in 1934. Maria Pasqua Zampini became a citizen of the United States on August 24, 1944. Maria resided at 500 North State Street, Painesville, Lake County, Ohio, when she was naturalized.